So beautiful and has been holding up well in rainy weather! We placed it under an outdoor furniture set, and it gives a nice pop of color to the space. Go tropical with a flourish in vivid Caribbean style. This delightful collection of quality loomed rugs provides an instant housewarming. Choose from an exciting array of botanical designs and curvaceous geometrics. Deeply pigmented tones contrast beautifully with soft neutrals for an effect as lush and welcoming as a sultry island garden. The woven loop pile adds an appealing accent of visual and tactile texture. A sun-warmed effect is captured in the rich russet and warm ivory tones of this lush floral design, enhanced with details of fresh island greenery. The delicacy of line hints at Colonial-era decor, emboldened and updated with Caribbean flair. Enjoy its lush pile and welcoming manner. Easy cleaning and maintenance - just rinse with hose and air-dry. Rug pad recommended. . Pile height is .25 inches. Dimensions 89.0 In. X 63.0 In. X 0.25 In. This is my first outdoor area rug to be used in my home. Love the quality, design, and ease or order and quick delivery. I will definitely order additional Nourison outdoor area rugs. I have 2 dogs and the fact that this rug is so easy to clean, is such a plus. Again, the design and quality are more than I expected. THANK YOU for a great product. I host a lot of barbecues during the summer, so I was looking for a great outdoor rug to brighten up my patio. This one is perfect!! The colors are great and the design is wonderful! Not to mention it shipped really quickly! I highly recommend this rug. This is a very cute and durable rug. Great colors. Perfect with my new furniture. I would definitely recommend this rug for your outdoor patio! Love the new rug! It looks great with my white wicker furniture. I especially love the pattern and the colors. The rich navy blue is true to the description as described on line. The colors are bold and beautiful!! I wanted an outdoor rug to complement my grey wicker sectional. This rug fit the bill. Purchased the 6x9 rug. Color is true to the picture with Navy, soft blue and cream. Hides dirt well. Tough to say how it will hold up in the summer heat but first impressions are positive! Vibrant colors. There is a beautiful contrast between the light blue and dark blue that makes the colors pop. The lightest color is a warm cream. Looks great on my outdoor patio. This rug is BEAUTIFUL. I have it on my front porch, partially under a white swing, with a blue and white garden stool and white planters. The rug design is just lovely and gets rave reviews from everyone. The navy is true with light blue accents. This blue indoor/outdoor rg is holding up beautifully on the back patio. The rug dries out very well after rain and has shown no signs of fading so far. We are very pleased. Great colors! This has held up well outdoors. I have received lots of compliments on this rug on my patio. It’s a great quality and dries out quickly after it rains. This rug is beautiful and the size is perfect! It's well made and the colors are vibrant. This rug is perfect in our garage....we have a bar set up and this gets a lot of people walking around on it - but it doesn’t ever look as dirty as I know it probably is. Purchased this rug for our pool changing room. 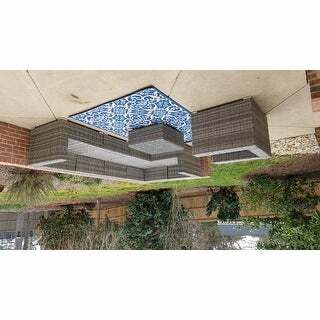 Looks great and flattened out pretty quickly, the corners don't flare up like a lot of outdoor rugs. So far it's made it through one summer of high traffic and is holding up well. It's inside so I'm not sure how the color would hold up in direct sunlight. 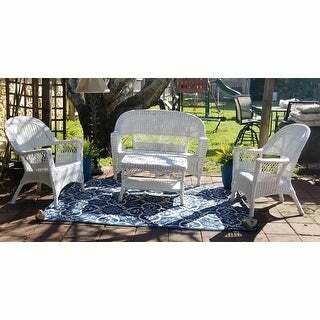 It will look perfect outside under my white wicker patio furniture with the new blue seat cushions! Yay!! "I see two sizes on this product. 5’3 x 7’5 and another indicating 6 x 8. Please clarify. " 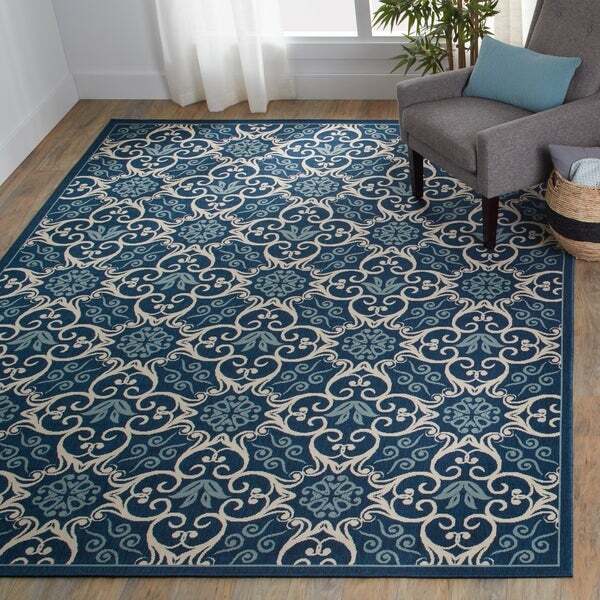 "What is the color specs (Ivory/blue, Ivory Navy, or Navy) for the picture showing for the Nourison Caribbean Indoor/outdoor Graphic Area rug?" How do you wash the rug?